This is my first post in my new server at iWebb.net. And now that you are seeing/reading this post, that means I have finally moved out of Philhosting’s hosting services. At last! Glenn and Nilo, do you think you should congratulate me? hehe. Now I can move on, move forward with my online life. 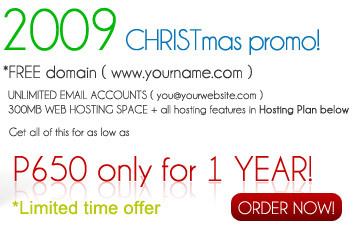 My next step would be to claim my free webhosting from my friend Jessie. But before that I have to claim my 1 year free domain first from iWebb.net as part of my 2 year subscription. But I haven’t made up my mind on what domain name to register. I wanted seanfrancis.com but it’s already registered since 1999. Maybe I should try amorfrancisean.com, seanfranciskeith.com, seanamoroso.com, or amorfrancis.net. Whew! I’m confused! Hi AMor..musta sensya na tagal ako nakadalaw grabeh hehe busy Mommy talaga ako pag school holidays. Wow congrats sa new webhosting at sa pagkapanalo kay Fren Jessie. Happy New Year 2009 din pala ano bayan. okay i’m booking all possible domain names with name sean francis ( 🙂 kidding) good to see that you moved up to new host. Sa wakas, nakalipat ka na rin. First time ko narinig ang web host na yan. Mabisita nga mamaya. Oo nga, salamat talaga at nakalipat na ako, yung mga friends kong iba nasa PH pa rin at down ang site, so sad, buti nga lang wala na ako doon. Next time na lang siguro yung amorfrancis.net, yung mariaamor.com, hindi pa rin taken. Nasabi ko na sa iwebb.net na seanfranciskeith.com iparegister. Hello world! Welcome me back!